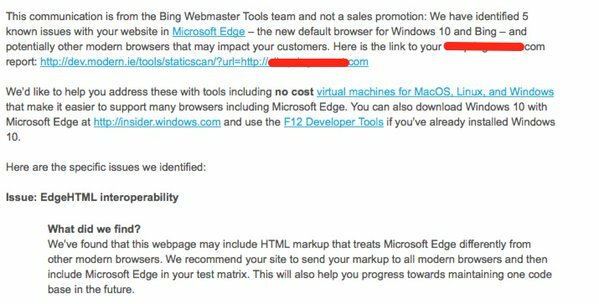 If you have a Bing Webmaster Tools account, chances are good you have received an email from Bing detailing your site has compatibility issues with Microsoft’s new browser, Microsoft Edge… and it wants you to download Edge for testing. It also happens to coincide with the news that Microsoft is for all versions of Internet Explorer other than version 11.
of the email he received from Bing. While it states that it is not a sales promotion, it does suggest downloading Windows 10 and Microsoft Edge for testing. However, there is also a . 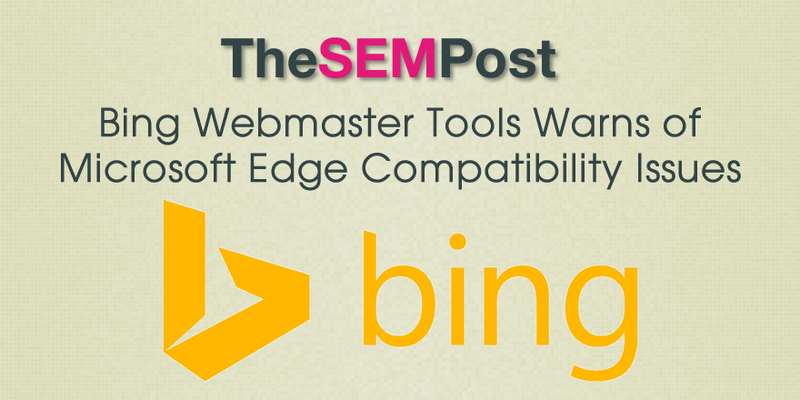 You don’t need to have your site listed in Bing Webmaster Tools, or even have an account to use the testing tool. It will also check for a variety of other technical issues. A few webmasters reported getting a similar email last month, but it wasn’t widespread. This time around, many webmasters received notices, and some reported getting them for all or most sites in their Bing Webmaster Tools accounts. Microsoft Edge has less than 3% market share, and they are also seeing the percentage of Windows 10 Edge users declining as well. So I imagine many webmasters won’t be eager to jump on board with making the changes. If you run Google Analytics, you can always check to see the percentage of visitors using Edge on your site, if you are trying to decide whether you need to invest any time and effort into making the changes. Jennifer Slegg is a longtime speaker and expert in search engine marketing. When she isn't sitting at her desk writing and working, she can be found grabbing a latte at her local Starbucks or planning her next trip to Disneyland. She regularly speaks at Pubcon, SMX, ClickZ and more, and has been presenting at conferences for over a decade.